Edgar Mitchell, Apollo 14 (lunar module, walked on the moon). With his experience in space with NASA and a PhD in astrophysics, his declaration some years later that “aliens prevented nuclear war on earth,” in lengthy interviews seen worldwide, engendered a great deal of attention and consideration. 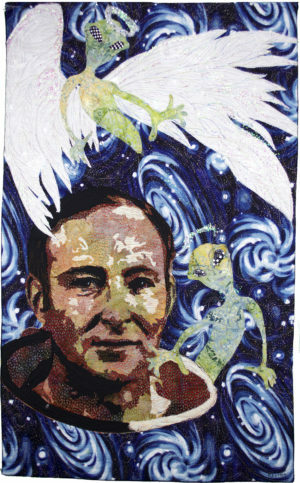 I have therefore depicted him with his guardian angel-aliens as he peers through a hole in the cosmos. Fabric collage, raw edge applique, thread painting, embellishment, free motion quilting. Cottons, novelty fabrics, metallic and polyester threads, glitter and glue, batting.